Browse: Home / 2019 / April / 03 / CBC Claims Canada Warming Twice As Fast As Globe, Yet Data Tell A Different Story: No Warming In 25 Years! It seams orchestrated our MET office SMHI did the same recently. 1991-2018 = +1.7C. This is not even 30 years and they could avoid 1989 which was very warm. Reason they differ is that they selected 25 city stations. I ran the whole network. CBC uses Steig et al. 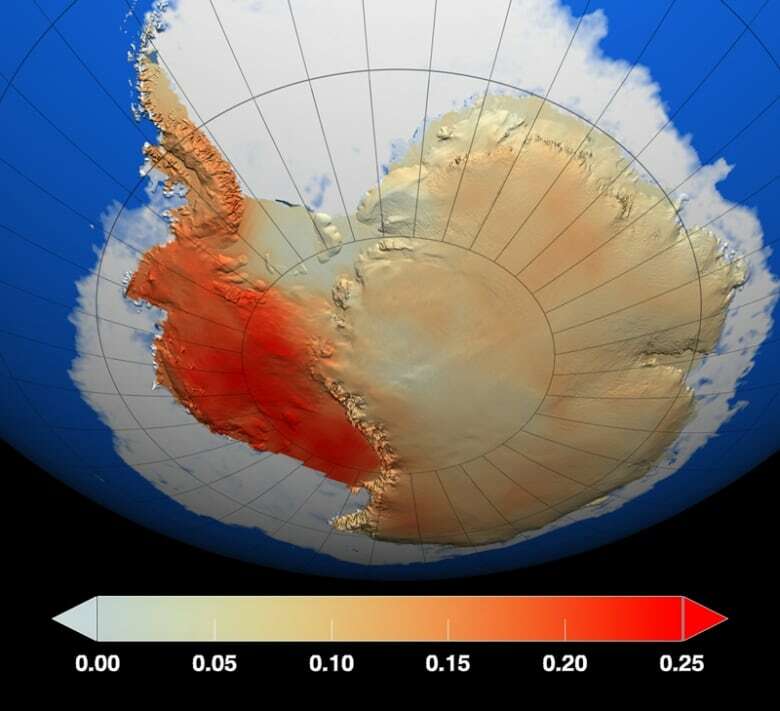 2009 Antarctica image in… 2019! So not only CBC’s Mortillaro failed to identify the source of the image correctly to the Steig et al. 2009 paper, but used an image obtained by flawed statistical processes debunked in a subsequent peer review publication! This is poor journalistic practice at best… Once again. Yup, that’s the real story here … and I somehow suspect the “leaker” isn’t going to need whistleblower protection. There must have been 8 or 10 places reported in the last year to be warming faster than any other place. Or so it seems. Anyway, only one can be correct. Maybe it is not actually “global” warming. Or, maybe it is not atmospheric warming that is being measured. The CBC was reporting on a brief for journalists released by Environment Canada on Monday to coincide with the imposition of a Federal “Carbon Tax” on the four provinces that had refused to implement one of their own. The report is not original research, but is a meta-study by EC’s scientists / activists of other published papers, wrapped up in hyperbole and government alarmist propaganda. What is “Canada’s Average Temperature” anyway? How do you average temperatures from Vancouver Island, Montreal and the High Arctic in a meaningful way? I hope to make a detailed analysis of Environment Canada’s climate records shortly. I have a copy of the official climate data set that EC published in 2008, which contains daily and summary records for 7,800 current and historical stations. Data varies from station to station, but consists of one or more of Daily Maximum Temperature, Daily Minimum Temperature, Rainfall, Snowfall, total Precipitation and Snowpack Depth. The data represents raw, unadjusted readings. The years covered for each station and dataset vary from a minimum of 1840 to 2007, some stations cover only a few years and some have data for over a century. I extracted the data into a database so that I can easily query and report on it. I have done some trial reports, such as for a given station, day of the year and dataset, show the value for every reported year. For example, for Morrisburg, Ontario, plot the daily maximum temperature for April 4th for every recorded year. I want to plot data for stations with a long history of observations, concentrating on stations that are close to, but outside of large urban areas, minimising the influence of the Urban Heat Island Effect. I have also created a table of daily records – for each station and day of the year, it contains the year in which the record high and low occurred, allowing me to plot the number of records set by year, and therefore see whether or not “the weather is getting more extreme”. I want to compare my results, based on the original data, to the reports currently being issued by Environment Canada. EC makes climate data available today on its website, but it is specifically described as the “adjusted and homogenised” climate data. Hey Senex, is that original dataset still available anywhere other than on your machine? And if not, can I get a copy of it from you? I did some analysis of EC’s data myself about ten years ago, but only for Ottawa, and now I don’t think I can get the raw data any more (at least from EC), as you pointed out. I don’t know if it is archived anywhere but my files are copied from the original dataset that EC distributed on CD.They are contained in a packed record format, which is documented in accompanying text files. The whole thing fits into a 270MB zip file, but when I extracted the data into a more user friendly relational database form, it took up several GB. I can email you a copy if you want. I would like a copy, yes, probably the 270 MB version for efficiency. Can you even email something that size? There is room in my recipient account, at least. Try sending to stevekj at gmail dot com. If that doesn’t work then a file dropbox of some sort might be an alternative. If true that EC now publishes “adjusted and homogenised data”, it would be interesting to see how EC has shifted historical data; has an artificial warming trend been introduced by EC’s adjustments? I would be interested in knowing whether EC has tampered with the data to support a CAGW hypothesis. The more Socialist the country, the greater the tendency to lie publicly. The troll tells us that the race to a climate emergency is accelerating. He’ll tell you we should trust him that our sources can’t be trusted, despite his many deflections, insults and lies. He says that “renewables,” or as tomOmason calls them, ruinables, are our energy future, despite their driving costs up everywhere, not to mention their near universal failure. The only thing “accelerating,” are the desperate lies of faux-greenies. “despite his deflections, insults and lies” – good one as well. Should look in a mirror from time to time, Yonason. I have plenty of support for my claim. SebH’s arrogance, ignorance and deceit are just too obvious to miss. Here are just a very few past examples. You poor persecuted little troll. You talk a big game, but you never produce anything. Now’s your chance. Go for it. And no vendetta, just trying to point out the lack of correlation between reality and some of the nonsense you post, usually, though not always, only after you’ve responded to a comment of mine. Tell you what. I’ll bet I can outlast you. How long do you think you can go without responding to anything of mine? How about a month? I’ll start after I post this. Yes, Canada has to be burning up. That is why so many Canadians move to Florida when they retire. That is why so many of them vacation in Cancun or go home to their native lands in India, Pakistan, Shri Lanka, etc during the winter. Is that satire or do you honestly mean what you wrote? As if the desire of some people to move to a milder climate would somehow change that the region they are living in is warming. It’s almost as bad as certain country leaders asking where global warming is hiding on a cold winter day. Multiple levels of credulity are required here. First, a CBC report that Canada is warming; second it is more than elsewhere; third that this could possibly be a bad thing. How miserably cold do you want Canada to be? Excellent material I didn’t have. Thanks. The circumference of our planet is 24,000 miles and it is 72% covered with water. In the Marianna trench of the Pacific, the ocean is so deep that if you placed Mt Everest on the bottom there would still be a mile of water above its peak. Ocean currents and tsunamis bring vast volumes of water of ever-changing temperatures to all parts of the world. The temperature of the earth’s crust is determined by the radioactivity of some of its elements. At +30,000 feet the earth’s atmosphere is colder than a bank manager’s handshake. Where do the climate change scientists put thermometers to record the planet’s temperature with 1.0C degree accuracy?